JAKARTA, Indonesia (CNN) -- Explosions tore through two luxury hotels Friday morning in south Jakarta, Indonesia, killing at least eight people, a presidential spokesman said. 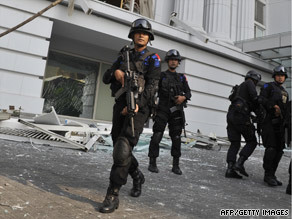 Counter-terrorist police commandos secure the damaged Ritz-Carlton hotel in Jakarta on Friday after the blasts. The number of injured was in the 40s, said Dino Patti Djalal, spokesman for President Susilo Bambang Yudhoyono. They were taken to area hospitals. Hours later, local television reported a car bombing in north Jakarta, but that report was immediately contradicted by various other media sources. Police sealed off the area around both hotel blasts, one in the Ritz-Carlton Hotel and the other at the J.W. Marriott Hotel, about 50 meters away. Djalal said the attacks were coordinated. Forensics experts are collecting evidence at the "disturbing scene," Djalal said. He said he had few details about the blasts, which occurred about 7:45 a.m. (8:45 p.m. Thursday ET) on Friday, Islam's holy day. "What I can say is one of the most damaged areas that we looked at, where the bodies were, was a lounge area in the Marriott near the lobby," he said. "That seems to be the epicenter of the bomb." "This is a blow to us, but I don't have any doubts that we will be able to uncover and find out the perpetrators," Djalal said. Police said the bomb at the Marriott likely came from the basement beneath the coffee shop on the ground floor, which would have been busy at breakfast time. In a Twitter post four hours after the blast, Marriott said: "Police responded immediately, sealed off the area. Guests @ both hotels have been evacuated & have been moved to a secure location." At the Ritz, windows were blown out on the second floor, as though the blast occurred from inside a hotel restaurant that would also have been crowded with a breakfast crowd, said witness Greg Woolstencroft. Another witness counted four foreigners among the wounded, according to state-run Antara New Agency. U.S. Embassy Press Attache Paul Belmont told CNN no U.S. casualties have been confirmed and that the embassy was monitoring the situation closely. The death toll may be higher than reported, said CNN contributor Tom Fuentes, a former FBI assistant director of international operations. He said two U.S. businessmen were treated for minor injuries. "There was a boom and the building shook, and then subsequently two more," said hotel guest Don Hammer, who was leaving his room in the Marriott when the blast occurred. "The shocking part was entering the lobby, where the glass at the front of the hotel was all blown out and blood was spattered across the floor, but most people were leaving calmly." Woolstencroft had just walked past the hotels and had gone to his nearby apartment when he heard an explosion. "I looked out my window and I saw a huge cloud of brownish smoke go up," he told CNN in a telephone interview. "I grabbed my iPhone to go downstairs ... and then the second bomb went off at the Ritz-Carlton, so I then ran around to the Ritz-Carlton and I was able to find that there had been a massive bomb that went off in this ... restaurant area and the explosion had blown out both sides of the hotel. "I also noticed that there were a number of injured people being taken off to hospital, but I only noticed one dead person at this point and time, that's all I saw. There has been extensive damage to both buildings, and at this point and time of course all the authorities are blocking up all the area and starting an investigation." He added, "It's obviously targeted establishments where there are Westerners and expats ... I can only assume it's something to try and send a message." The television executive said he had lived at the Ritz for a year before moving to his nearby apartment and had been impressed by the facility's security. "I just don't know how someone could get in there with a bomb, given the level of security and screening that people have to go through," he said, citing armed guards at checkpoints and thorough searches of people, bags and vehicles. The Marriott was the site of a terrorist attack in August 2003 that killed 12 people. In that attack, an explosives-laden vehicle pulled into the motor lobby of the Marriott and exploded at the height of the lunch hour. Friday's attack "was not nearly as bad," said John Aglionby, a reporter for the Financial Times who was at the site of both blasts. Former CNN producer John Towriss, who has spent many years in Jakarta, said the Marriott and Ritz often share employees and an underground passageway connects the two buildings that sit across the road from each other. Towriss said the Marriott has beefed up security since the 2003 attacks, making it impossible for people to drive up to the hotel in cars. Both hotels set up metal detectors and thick concrete barriers to prevent car bombers. "I always thought I was safer at the Marriott because I thought it had already been bombed once," Towriss said. "I thought that another hotel would be targeted." CNN's Andy Saputra in Jakarta and Miranda Leitsinger in Hong Kong. contributed to this story.